It is not enough to send people to leadership training. Leaders must learn to maximize team performance to drive business improvement. These books show how leaders improved their business by first creating high-performing, engaged and empowered teams. Below are suggested books or articles that have influenced or align with the New Reality Leadership approach. Jeff McManus grows things. As the Director of Landscape Services at the University of Mississippi, he grows plants….he grows people….he grows ideas. Jeff is a problem-solver, understanding that doing more with less is a 21st century mandate. 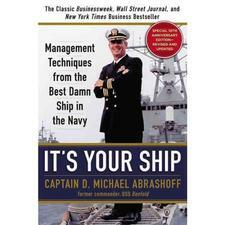 Captain Abrashoff was assigned to the worst ship in the Navy and turned it into the best ship in the Navy. He describes his approach. While NRL was created before seeing this book, the NRL content strongly supports the same approach and prescribes the same vision as Abrashoff. We suggest having leaders read the book as you create or update your vision. Then, use the NRL process to help shift leader thinking in ways to create the culture described in the book. We also suggest reading his next book called It's Our Ship. Originally, Abrashoff was always trying to out do the other ships. NRL prescribes learning and then helping other leaders or sites learn along with you. Abrashoff realized this short coming and talks about it in his sequel. Good to Great compares 15 pairs of companies and deciphers why one of the comparison companies succeeded and the other one either failed or had much lower financial success. NRL looked at these key distinctions and found that many of the NRL case studies related to one or more of these characteristics. Since the book was written, a number of the stronger companies have since declined. In some cases, they disregarded the very things that made them great. NRL has created a study guide of 11 key topics from the book that leaders can use to supplement their development. The module in NRL called Leadership Styles is based on a number of different models. One model comes from this book called The Leader's Window. Ken Blanchard has also done some extensive work called Situational Leadership. Both approaches are very good. NRL combines thoughts from these books plus actual coaching experience to create the model in NRL. This book provides deep understanding into the process and will help leaders understand how the leadership styles concept is a key foundation to effective leadership. The Covey organization created a succinct, powerful process called 4 Disciplines of Execution. It is a proven process to use very engaged, empowered employees to apply a 4 step process that accelerates business improvement. NRL provides the foundational leadership mindsets that allows the 4D managing process to make a huge difference in your organization. Covey has many great resources you may want to review. ​​A key concept of the 4D process is to understand the difference between the everyday Whirlwind of things that must be done to the longer term goals needed to drive continuous improvement. NRL provides tools and concepts to help teams make shifts in focus to ensure they balance the important, longer term goals while dealing with the demanding day-to-day urgent tasks. ​Gene Daulton and Paul Thompson did extensive research in career development and why similar employees either excelled or stagnated. Many employees who may not have been tagged as high potential employees have grown their careers far beyond what most would have imagined by applying the key principles found in Novations. While our industry landscape continues to change, the guiding principles remain the same. NRL built upon this foundation and other research to create The Tier Model. While the concept is similar, the Tier Model has 3 Tiers vs. 4 Stages. The Tier model is then weaved throughout all of NRL as a foundation. Reading Novations provides deeper insights into how anyone can expand their ability to contribute to organizations. Kip Tindell is the CEO of The Container Store. The Container Store is a publicly owned retail chain. Many publicly owned companies focus first on the shareholder and are often short-term profit focused. The Container Store has a different philosophy. They invest highly in employees first who then drive customer satisfaction which in turn improves the shareholders return. NRL believes that companies must invest strongly in the employee through development, engagement, and empowerment. These employees will then own the work and bring their best to the team each day. While cost focus may drive short term upward results, only by following the principles in Uncontainable, which also align with NRL, will a company be successful longer term. Tony Dungy, professional football coach, discusses the mentoring approach he used with his teams. Mentoring takes coaching to a deeper level requiring a stronger time and energy commitment. Tony describes how he practically applied key principles that drove player and team improvements and were crucial for their overall success. The combined modules and perspectives of NRL align with his approach and are the puzzle pieces needed to strengthen your coaching and mentoring approach to drive your business improvement. With every employee who walks out the door costing the company up to 200 percent of their annual salary to replace, retention is one of the most important issues facing businesses today. This international bestseller gives everyone from the CEO to the front-line supervisor solutions for keeping the employees they simply can't afford to lose. Love 'Em or Lose 'Em shows that what employees really want-even more than costly added perks like bigger salaries-are meaningful work, opportunities for growth, excellent bosses, and a sense of connectedness to the group. They offer 26 strategies-from A to Z-that managers can use to keep their star employees' on the team. This revised edition includes new tips, "to do" lists, stories, and new research.